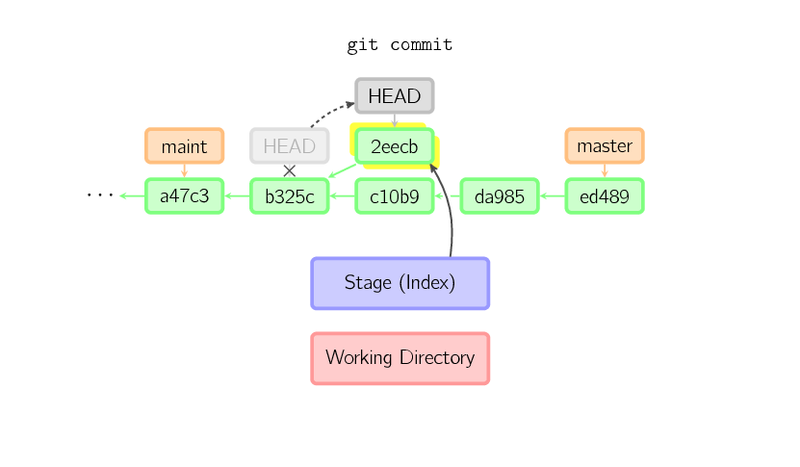 Why did my Git repo enter a detached HEAD state? As far as I know I didn't do anything out of the ordinary, just commits and pushes from my local repo. So how did I end up with a detached HEAD? Any checkout of a commit that is not the name of one of your branches will get you a detached HEAD. A SHA1 which represents the tip of a branch would still gives a detached HEAD. Only a checkout of a local branch name avoids that mode. For example, if you checkout a "remote branch" without tracking it first, you can end up with a detached HEAD. this gives you a history of how your HEAD and branch pointers where moved in the past. the top of this list is one reasone one might encounter a DETACHED HEAD state ... checking out a remote tracking branch. It can easily happen if you try to undo changes you've made by re-checking-out files and not quite getting the syntax right. You can look at the output of git log - you could paste the tail of the log here since the last successful commit, and we could all see what you did. Or you could paste-bin it and ask nicely in #git on freenode IRC. It can happen if you have a tag named same as a branch. produces detached HEAD at "release/0.1". If you expect release/0.1 to be a branch name, then you get confused. A simple accidental way is to do a git checkout head as a typo of HEAD. Note that if you do this, any further attempt to checkout origin/foo will drop you back into a detached head state! The solution is to create your own local foo branch that tracks origin/foo, then optionally push. This probably has nothing to do with your original problem, but this page is high on the google hits for "git detached head" and this scenario is severely under-documented. When you checkout to a commit git checkout <commit-hash> or to a remote branch your HEAD will get detached and try to create a new commit on it. This article illustrates how you can get to detached HEAD state. Can't switch from detached HEAD when trying a hard reset? Fix a Git detached head? What's the difference between HEAD, working tree and index, in Git? Why does git perform fast-forward merges by default? What's the difference between “git reset” and “git checkout”?